Surprise your guests with unusual wedding labels on alcohol bottles. Personalized wedding wine labels are the perfect way to make your ceremony unique. Here you can find a wide range of specially prepared vodka or wine labels for weddings templates composed by a professional graphic designer. Choose your favourite one, add your text or customize the label the way you like. A bottle of good wine is getting more and more popular as a gift for the couple, instead of bunch of flowers or wedding cards. Guests also can replace the traditional wine label, the label that will remind the young couple of this special day. Labels are self-adhesive, easy to use and ready to stick high quality personalized products made carefully for individual order. 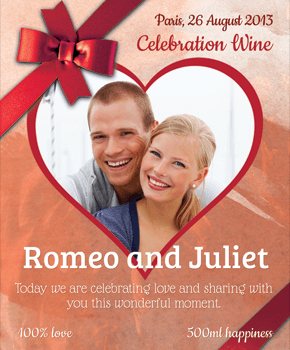 It’s time to make your own wedding wine labels!